A straight forward and economical way to get your 6 full bottles of SunBlaster saving more than $4 per bottle. 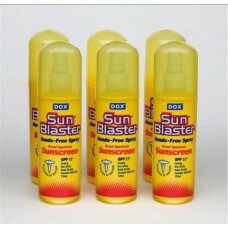 Dox SunBlaster 125ml This is the standard bottle size in our range. A convenient size for the go.. Extra Anti-fog Gel 5g Features 1. Our Anti-fog gel can be used for all lenses include Multi..